In this article, I will first explain what is transaction and what are the properties of transaction and then I will try to explain how we can implement transactions in WCF service. So we will create WCF services which do database transactions and then check the transaction. I will first understand the steps how to enable transactions in WCF services. At the end of the article, I will try to force an error and see how the transaction is rolled back after the error. · Atomicity: ensures that all operations within the work unit are completed successfully; otherwise, the transaction is aborted at the point of failure, and previous operations are rolled back to their former state. · Consistency: ensures that the database properly changes states upon a successfully committed transaction. · Isolation: enables transactions to operate independently of and transparent to each other. · Durability: ensures that the result or effect of a committed transaction persists in case of a system failure. Step 1: For service operation Setting. • Allowed Transaction may be flowed. • Mandatory Transaction must be flowed. • NotAllowed A transaction should not be flowed. This is the default value. · TransactionScopeRequired: indicates whether the method requires a transaction scope for its execution. · TransactionAutoComplete: indicates whether to automatically complete the current transaction scope if no unhandled exceptions occur. Binding - There are only few bindings in WCF that can support transaction, these are NetTcpBinding, NetNamedPipeBinding, WSHttpBinding, WSDualHttpBinding, and WSFederationHttpBinding. So, in order to configure transaction, one has to make a choice out of such bindings. Though these bindings do have transaction support but by default it is disabled, so one has to make them enabled. We also need to enable transactions for wsHttpBinding by setting the transactionFlow attribute to true. We need to use TrasactionScope Attribute on to the client side for Transaction. Create the TrasactionScope to execute the commands, guaranteeing that both commands can commit or roll back as a single unit of work. In this way you can test the Transactions is working or not on the client side. I have attached Code snippet for that. Please download this. Windows Communication Foundation (WCF) is a programming interface as part of .NET Framework. In this article I will tell you how to create WCF Service and how to host using self-hosting and how to consume this service in Web Application. In this article I will discuss about self-hosting your WCF Service, because it’s the most flexible and easiest way to host WCF services. Another way to host WCF Service is using Internet Information Services(IIS). IIS will be explained in my other article. Step 1: Select the new Empty Solution and give name WCFProject. Step 2: Then add new Class Library Project and give name SaleClassLibrary. Step 3: Then add reference of System.ServiceModel and System.Runtime.Serialization into that project. Step 4: Then add new Interface ISaleService. Step 6: Build your Class library. Step 8: In this project Add reference of the WCF Class library project and Add reference of System.ReferenceModel Namespace. 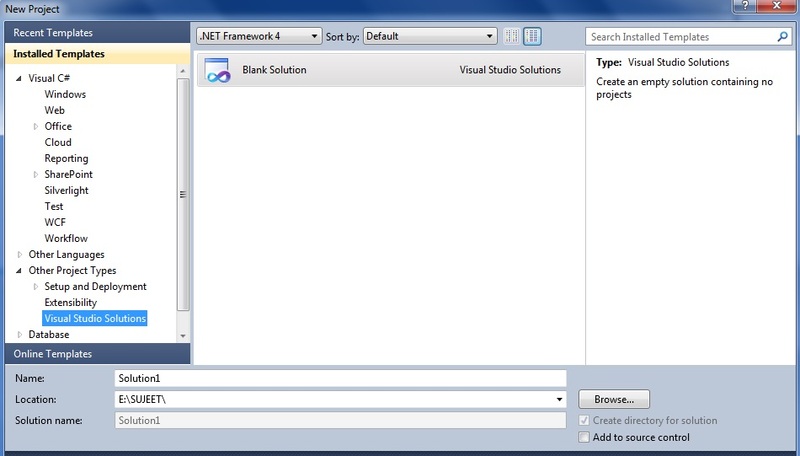 Step 10: Build your Console application and set as startup project and run the project. WCF come with ServiceHost class that makes you can host your services in your own application easily. With WCF what you need to do is just configuring your service endpoint and calling the .open() method of ServiceHost. To be able to host WCF service you need WCF runtime and .NET application where you want to host your service. • Flexible: You can easily decide when your service active by calling the .open() and .close() method. However, this self-hosting method has some disadvantage. This self-hosting service is reachable only when the application that hosts the service is running. So, self-hosting is only suitable when the development and demonstration phase of your system.